Gouache on handmade Khadi paper. Unframed. 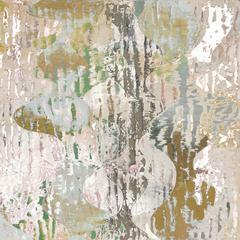 Joanne Freeman's works on paper are made with gouache on handmade Indian Khadi paper. She uses tape to mask out shapes and employ hard edges, working spontaneously, placing down a shape and then building upon it. Her use of singular color accentuates the interplay of ground, foreground relationships. Freeman tries to merge random gestures and idiosyncratic shapes with a controlled and reductive abstract language. This piece is part of a series titled "Covers", it pays homage to the graphic style of album covers, paperback book covers and media that permeated mid-century popular culture. The limited choices of early printing technology leant itself to simple, direct and innovative compositions that Freemans also strives for. Joanne Freeman is an American abstract painter who creates minimalist reductive paintings and works on paper, featuring hard-edged abstract forms and bold, vivid, gestural markings. She lives and works in New York City.